I met with a personal trainer at the gym on Monday. It was the extra motivation I needed to start to push myself during workouts and switch up my routine. Lucky for me, personal training sessions are included as a part of my gym membership. I met with my trainer for the first time a week ago to go over my goals. Then he created a workout designed to help me reach my goals. He created a total body routine that I will do 3 times a week, and I can mix in additional cardio days as well. My goal is to build muscle and tone, losing a few pounds will be a nice side effect, but mostly I want to be stronger and more fit overall. This week has gone really well so far. I was surprised how sore I was after the first day, but I love that feeling because you know you're getting results! The plan is to do this routine for two weeks, then I will meet with the trainer again to incorporate new exercises that will continue to push me. Even though there isn't as much one on one time with the trainer as I might get paying for sessions, it works for me because I know I have to check in with him every few weeks, and I want to show that I'm making progress and getting stronger. It's an affordable way to get personalized workout routine and I'm happy that I finally took advantage of it after a year of going to this gym! 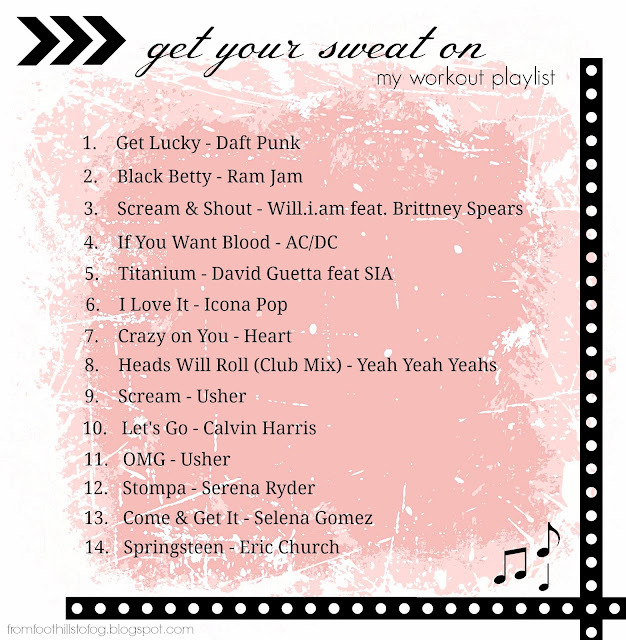 I created this playlist to help get me through the workouts and make it more fun. I love the mix of 80's rock and current top 100 hits with a little country thrown in at the end for a cool down! If any of you are in need of a few new songs to help motivate you at the gym, hopefully this will help! I hope you all have an amazing weekend! We have some fun things planned so I'm looking forward to it! yay good for you! i think designing the programs is the most important part - that was huge for me. i just didn't really know what i should be doing based on my current fitness or where i wanted to be. it's confusing. glad to hear this is helping you and can't wait to hear more! oh thanks for this! i always need good new songs! Love it! I think going to a personal trainer would be excellent. It's awesome you get one included with your membership!